This week is a rest week for the Alpha Bakers (because we've done A LOT of baking). I chose to make it a catch-up week because I don't like to miss out on trying cakes (I missed baking this cake when it was scheduled at the end of last year) and plus it looked pretty delicious. It's the Renee Fleming Golden Chiffon, which is a lemon chiffon cake served with lemon curd cream. It's also meant to be sprinkled with some lemony dust but I miscalculated and ran out of lemons to zest, so no fairy dust for me. This cake was incredibly soft and light and, served with the lemon curd cream, was absolutely delicious. I'll be making this again very soon. Rose dedicated this cake to her favourite soprano, Renee Fleming. I have to admit I wasn't familiar with her before this cake, but was able to appreciate her beautiful voice courtesy of YouTube. I can see why Rose is a fan. This cake is made in a very similar way to the other light cakes in The Baking Bible. A mix of flour, sugar, lemon zest, egg yolks, oil and water are whipped together until thickened, and then the beaten egg whites are folded in. It's meant to have lemon oil but I didn't have any so I put some lemon juice in instead. I thought the finished cake was lemony enough with the juice and the zest. I considered cutting down the sugar since I found the Pavarotti cake a bit sweet. Then I panicked and put it back in because I thought it might ruin the structure of the cake, and structure is all with chiffon cakes. I feared ending up with a collapsed mess. 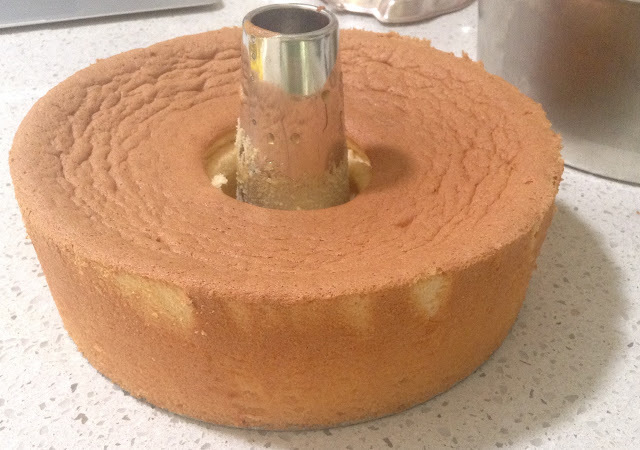 The recipe instructs us to use a high sided springform tin but I have this reasonably expensive angel cake tin which I'd like to get my money's worth out of, so I used that. 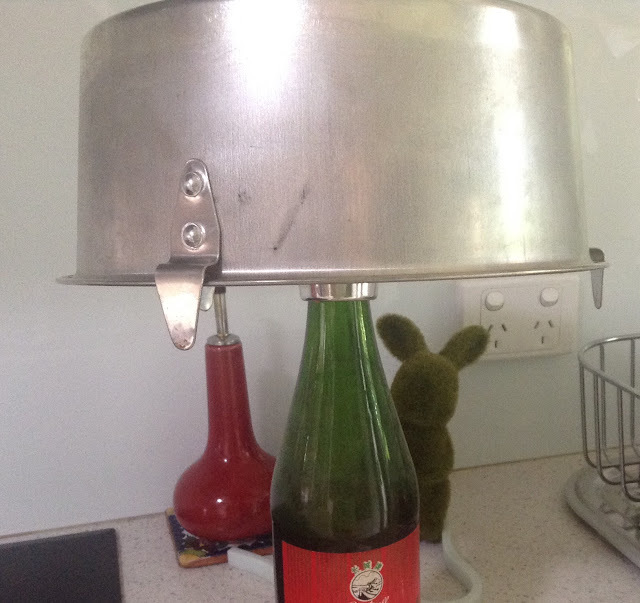 It's also custom made for balancing upside down, which you need to do when cooling this cake. (the cake, that is, not the baker). When I took the photo I didn't realise the bunny was peeking at me from behind the tin. The cake turned out looking very nice and it didn't fall out of the tin when I cooled it upside down, which is always a relief. I forgot to take any photos of the lemon curd cream process. 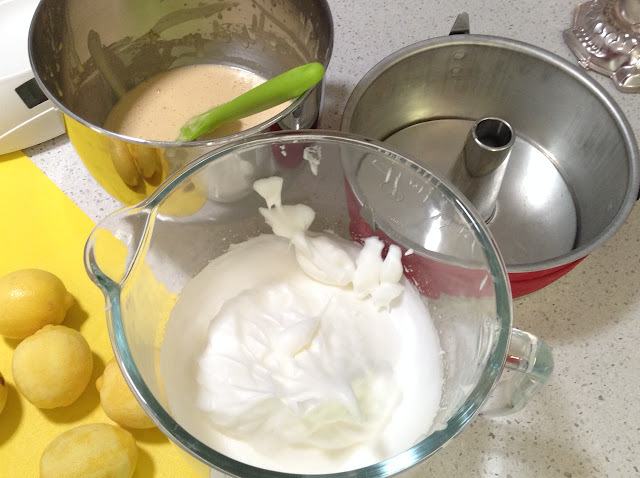 It is a very stiff lemon curd which is beaten into whipped cream. This is a fantastic recipe just by itself. And, oh so delicious! This was also a great recipe because I got to use my new angel cake cutter. This has to be one of the most unnecessary kitchen tools ever invented. I'm not sure who did invent this (did they have a lot of time on their hands?) and I've never seen it used or sold in Australia. But there's nothing wrong with a bit of inexpensive frivolity and I've had it on my wish list ever since I saw it on another Alpha Baker's post (sorry I can't remember who). I was lucky enough to get a gift voucher for Christmas and promptly ordered this and a rotary apple peeler (also pretty cheap) that Patricia from ButterYum recommended. The reasoning behind the cutter is that the cake is so delicate a knife would squash it when you cut a slice. 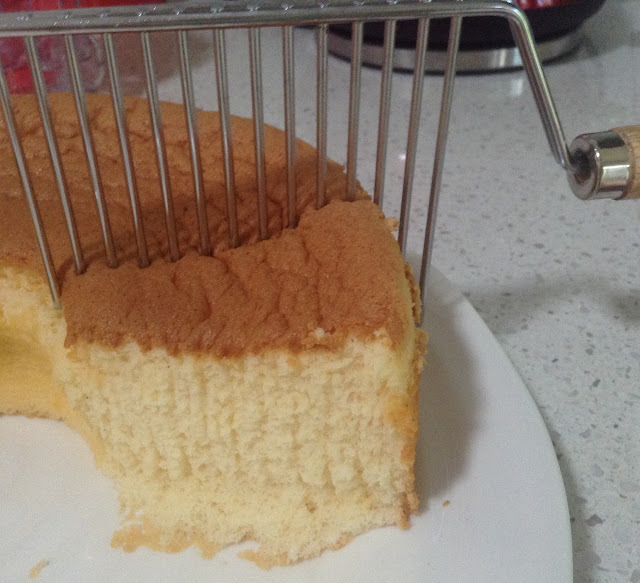 The sharp tines of the cutter loosen the cake and then you can gently separate the slice. It makes a fluffy but slightly ragged cut. Next week the Alpha Bakers are all back from our break and baking Lemon Almond Cheesecake. 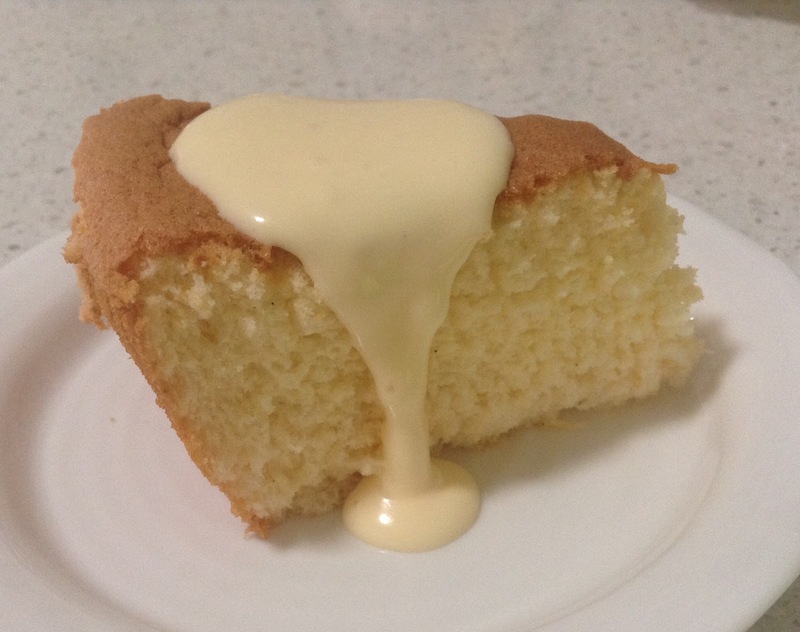 What a great idea using your special angel food cake pan! Your cake looks perfect. I often times feel a need to be balanced after baking one of Rose's more complicated recipes! We have the same catch up week! :D Your cake looks yummy and I like how you made in tube pan too! Also interesting chiffon comb cutter!